Notes - Requires a 110 volt electrical outlet independent from the garbage disposal. Not recommended for use on homes equipped with tankless water heaters. Not recommended for use on homes equipped with a backflow prevention on the hot water heater. Must be installed a minimum of 25 Pipe Feet from water heater. A Non-Switched outlet is needed to provide power to the pump. 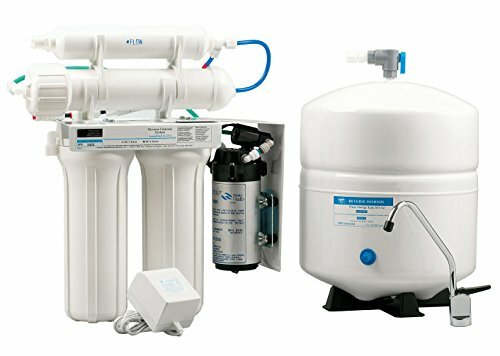 The ZeroWaste® Reverse Osmosis System with its patented design wastes no water where other systems waste as much as 4 or more gallons for every 1 Gal. of drinking water produced. This system revolutionized the industry; the patented ZeroWaste® Reverse Osmosis System is the first Reverse Osmosis System that does not waste water by returning unused water from the system back to the home's hot water supply. Reverse Osmosis reduces particles down to the molecular level. The same process used by major bottled water companies. The process of Reverse Osmosis reduces salts and other impurities, giving you a high quality, great tasting water. This system is 100% efficient, as no water is lost to drain in the production of the Reverse Osmosis Water. The ZeroWaste® Reverse Osmosis System with its patented design wastes no water where other systems waste as much as 4 or more gallons for every 1 Gal. of drinking water produced. This system revolutionized the industry; the patented ZeroWaste® Reverse Osmosis System is the first Reverse Osmosis System that does not waste water by returning unused water from the system back to the home's hot water supply. Certifications: Certified by IAPMO to UPC, IPC, IGC 159-2000A. Reduction Claims Validated for this unit by IAPMO. Product Dimensions (Due to the individual fittings the exact measurements may vary slightly.) Rack and Cartridges (16.5" W x 17.3" H x 5.3" D) Tank (13.6" H x 11.0" D). Specifications: Requires a 110 volt electrical outlet independent from the garbage disposal. Other important Requirements listed in Product Descriptions below.